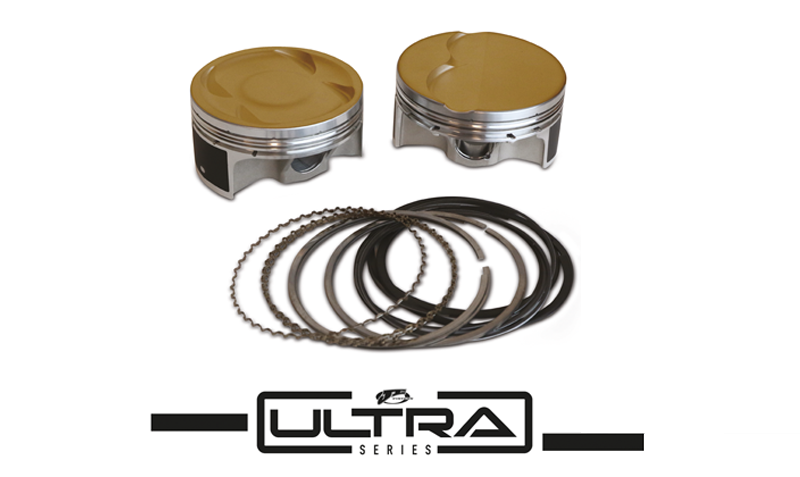 Ultra Series pistons are the cream of the crop, combining all of JE’s premium features into a ready-to-ship shelf part. Ceramic crown treatment, lateral gas ports, Perfect Skirt coating, accumulator grooves, thick-wall wrist pins, double pin oilers, and a premium, carbon-steel ring pack are all part of the winning formula. In addition to the all-star feature list, Ultra Series pistons incorporate a revolutionary, new forging style that strengthens the piston at the material level outward. Grain-Flow Optimization is a breakthrough, and proprietary, piston forging technology and the result of tireless research and development of the in-house JE forging process. For the first time, engineers are able to precisely control metal grain direction around key structural elements of a piston, such as the crown and pin bosses, for exceptional strength improvements. All these traits combine to make the new Ultra Series the most technologically advanced, and feature rich, JE piston line to date. Check the JE Pistons Ultra Series Part Numbers and Applications here.